We’ve received numerous comments and compliments since the initial airing of the Enterprises TV segment featuring Acctivate – thank you to all those who have reached out with your positive feedback! Included with the comments, were a few curious about the background of the segment, so we thought we’d provide a bit of behind the scenes information on how the segment developed from concept to broadcast. 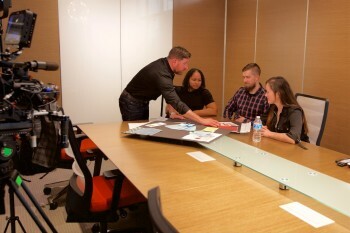 After Alterity agreed to being featured on the Enterprises TV show, Alterity’s President & CEO, Brian Sweat, Alterity’s Sr. Marketing Communications Specialist, Erica Avila and I began the planning process in early fall of 2015. 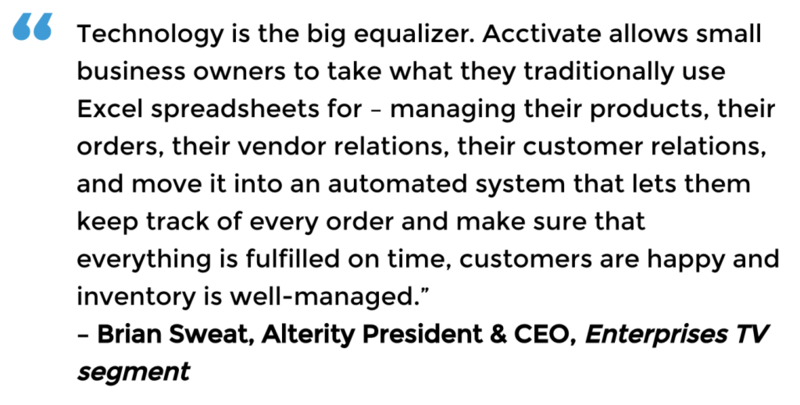 Having worked with the Alterity team for nearly a decade as a consultant, I’d heard firsthand the many accounts cited by customers of how Acctivate had helped them grow their business. 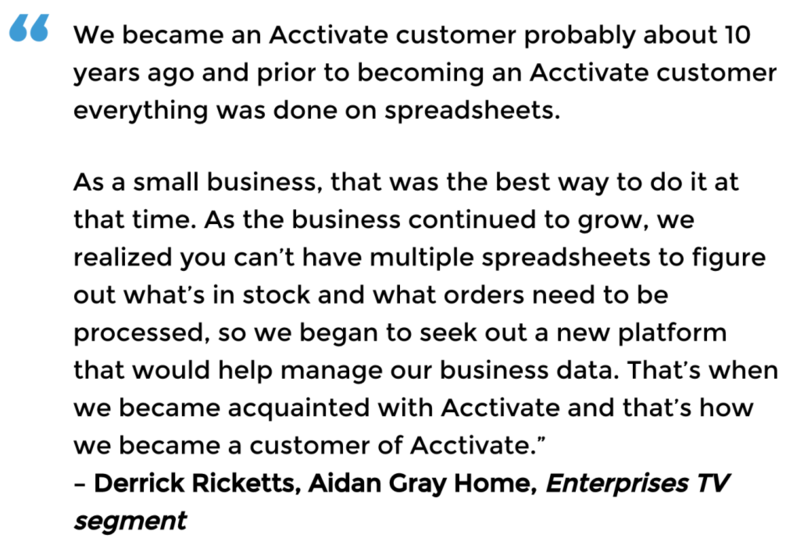 Time and time again, customers would state that they would not have been able to reach the level of success they’d achieved in their business without Acctivate. We decided it was the overall concept of technology helping small businesses reach and exceed their goals that should be the focus of the segment. The effective use of technology is the key element enabling small businesses to reduce costs, grow their business, and compete with companies far greater in size. During our discussions, Brian summarized it best – “Technology is the big equalizer.” With that – we had our theme for the segment. Working with Enterprises TV, we developed a rough outline of how the segment would flow – voice-over providing background information on the industry along with interviews with a customer, a consulting partner, and Brian to illustrate how Acctivate can help small businesses tackle the common challenges they face. While the segment was only five minutes in length, hours of potential background content was written, and later used developing the final voice-over script. Long-time Acctivate customer, Aidan Gray Home, who offers elegant European-inspired home décor, furniture and lighting, agreed to both appear in the video and serve as our shoot location for the segment. Michelle Barr of Firefly Business Group, who is an Acctivate business consultant and works with Aidan Gray Home, was also confirmed for an appearance. As the end of the year neared, production was set to begin just before the holidays. The day of the shoot began early in McKinney, Texas with the interviews scheduled for the first part of the day. Following the interviews, B-roll footage would be captured to be used in conjunction with the voice-overs. 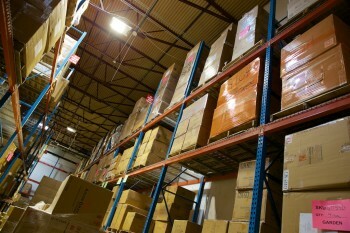 We worked from a shot list of recommended locations and situations provided by Enterprises TV. Derrick was our first interviewee and sailed through his on-camera appearance, covering the challenges Aidan Gray Home faced prior to implementing Acctivate, how the use of business technology accelerated their growth, and how Aidan Gray benefits by centralizing their information and processes in Acctivate. Next, Michelle made her debut, discussing how customers can continue using QuickBooks for their accounting solution, while gaining additional functionality from Acctivate to run a growing distribution business. Brian finished up the interviews, providing examples of how specific features, such as EDI and multi-channel order management and fulfillment, can have a significant impact on the operations of a small business. Following the interviews, we shot close to 50 different clips of scenes, capturing the Aidan Gray Home work environment in action. From dropping in on team meetings, to catching inventory making its way into the warehouse, the daily interactions of an office and warehouse of a successful distributor provided the perfect backdrop for the voice-over verbiage that would bridge the video and interviews. After nearly eight hours on location, the filming was complete and, as they say, that was a wrap. A lengthy endeavor, editing is the magical process of taking hours of raw video footage that could be combined in countless ways and distilling it into a five-minute segment that succinctly and effectively tells the story. The first airdate for the segment was April 2, 2016 on KSTC-TV in Minneapolis-St Paul. The segment airs three more times in that market during April and then continues to roll out in other major U.S. markets throughout 2016 and early 2017. Aidan Gray Home for allowing us to take over their offices and warehouse for the entire day of production, to Derrick Ricketts for the articulate interviews and on-site coordination, and to the Aidan Gray team for their cooperation and appearances in the segment. Michelle Barr of Firefly Business Group, Brian Sweat, and our “frustrated business manager,” Karla Dearston. Our video cameramen, Joel Hinrichs. Production by Kim Hull & still photography by Greg K. Hull of Chasing Light Media. Kim is a partner with Chasing Light Media and has been a part of the Alterity team as a marketing and digital media consultant since 2006.